Here is a clip from a recent BodyTalk Fundamentals Study Group. Our history in diagnosis and disease has shaped the way we interpret imbalance or failing body parts. This short clip provides a different perspective on the complex interrelationships in the bodymind. Interesting Read. Tensegrity is Movin' on Up! Rep Prog Phys. 2014 Apr;77(4):046603. Tensegrity, cellular biophysics, and the mechanics of living systems. Ingber DE, Wang N, Stamenovic D.
The recent convergence between physics and biology has led many physicists to enter the fields of cell and developmental biology. One of the most exciting areas of interest has been the emerging field of mechanobiology that centers on how cells control their mechanical properties, and how physical forces regulate cellular biochemical responses, a process that is known as mechanotransduction. In this article, we review the central role that tensegrity (tensional integrity) architecture, which depends on tensile prestress for its mechanical stability, plays in biology. We describe how tensional prestress is a critical governor of cell mechanics and function, and how use of tensegrity by cells contributes to mechanotransduction. Theoretical tensegrity models are also described that predict both quantitative and qualitative behaviors of living cells, and these theoretical descriptions are placed in context of other physical models of the cell. In addition, we describe how tensegrity is used at multiple size scales in the hierarchy of life—from individual molecules to whole living organisms—to both stabilize three-dimensional form and to channel forces from the macroscale to the nanoscale, thereby facilitating mechanochemical conversion at the molecular level. Click here to view source of the article. I have suffered from depression since I was in high school and likely even before that. I had no idea what was wrong with me. I just felt depressed all the time even though I had a great life. I was good in school, had great jobs, great friends, a great family – nothing was wrong except for how I felt all the time. When I was about 24, I had a boyfriend who told me he was leaving me because he couldn’t handle my depression and that I should go on medication. What the hell was depression? I had no idea what he meant. I went to the doctor and was put on medication and lived on it for years. I was angry, mean, suicidal, even cutting myself at times because it was the only way I knew to get the rage out without going insane. I always just thought that I was crazy and many times would dare myself to commit suicide, sometimes taking enough pills before going to bed that I didn’t know if I would wake up. It was a very difficult time and the worst part is that I hid it from almost everyone. I remember lying on the floor, bawling in agony and answering the phone, chatting like nothing was wrong, then going back to the agony. Life felt like a curse!!! I met an amazing man who offered a lot of support through some really tough times and I am so grateful for him. He introduced me to a therapist who did EMDR treatments and it helped me a great deal. We then got married with the hope of having children. We tried to get pregnant but had no luck. This just pushed me further and further into depression because I kept thinking having children would make me happy – something in this world had to make me happy eventually. I am so grateful now that I was unable to get pregnant at that time because I was still an emotional wreck, even though I had improved enough to feel stable at times. One day, my mother-in-law called and asked if I had ever tried BodyTalk. I have to admit that what she described sounded a bit crazy to a computer programmer like me but I was willing to try anything to get pregnant at that point. I remember my BodyTalk session with Allison Bachmeir was just so fascinating and I just wanted to know more about what she was doing. I signed up for Modules 1 and 2 before I left her clinic and I began my BodyTalk journey. I fell in love with BodyTalk – it was my passion – I couldn’t stop taking BodyTalk courses because I just wanted to learn more. I started a practice in March, 2007 and have enjoyed every moment of it. I was able to wean off my medication with the help of BodyTalk before getting pregnant in 2008. I had manyBodyTalk sessions, including one with Dr John Veltheim and took a number of BodyTalk course before getting pregnant and having 2 beautiful babies. Having children was the most exciting thing for me, however, I began feeling like I was being pulled down the spiral of depression once again but because I was not suicidal like before, I did not recognize it as depression – until I had a session from Dr Veltheim in 2012. His session addressed issues around the depression that I didn’t know I had. A few days after his session, I began to see a therapist who led me to live in awareness – to watch how I am living. Living with awareness showed me that I was so depressed but I had kept myself so busy that I never recognized it. I knew that I needed to see a doctor. I went to see my doctor the next day and I felt like the biggest failure sitting in the waiting room. I was a BodyTalk practitioner – I am supposed to help people feel better – why on earth can’t I help myself feel better??? I got the prescription for the antidepressants and I literally felt better the second I had the prescription in my hand. I now see how I had such a strong belief in medication and that is why I had to use the medication in order to feel better. I saw Dr Veltheim again in April, 2013 and had another session from him. I was freaking out before my session, wondering if I should tell him that I went on anti-depressants – would he think I am a failure as a practitioner for having to take medication? I went up for my session with him and very sheepishly told him about the medication and he looked at me and said, “that’s great because sometimes the medication will help calm your brain down enough for the BodyTalk sessions to work” Phew, he didn’t think I was a failure! He did a session on me and I did feel much better after but still felt like I needed medication in order to function. In April, 2014 I saw John again for PaRama2 practical in Calgary. He did a session on me and when I came home, I reached for my antidepressants and intuitively felt like I no longer needed them. I stopped taking the pills that day and have never felt better. It has been 3 months now and I feel great. I am certainly not giving anyone the advice to quit their medication cold turkey without the assistance of their doctor but I just knew that I no longer needed the pills. I see now, looking back, that the medication helped me cope better with life so I am so grateful for the pills but I see how important it is to continue on the path of healing to get to a space where we no longer need medication. I feel alive again. I FEEL my emotions again. I feel sad and frustrated at times but I also feel happy and peaceful and alive as well – something that had felt so foreign to me for so long!!! I am so grateful every day for the BodyTalk System. I continue to heal in so many different areas of my life using BodyTalk – my relationships with others and with myself continue to change, my fears and worries are continually changing, my physical health is changing – basically everything in my life continues to change because I continue to have BodyTalk sessions regularly and I continue to take BodyTalk classes and I also continue to teach classes. I love noticing improvements in my mental, emotional, physical and spiritual health and will never stop anticipating new levels of healing on this amazing journey that I am on. Even through life’s challenges, I am able to find peace and accept that life is happening FOR me, not TO me and that inner wisdom and healing is happening as a result of the challenges!!! Millions of years of co-evolution have led to a delicate balance between the immune system and our microbial residents. A calibrated system of checks and balances has developed that keeps immune cells from being overzealous, overly aggressive, causing inflammation or attacking cells of our body. At the same time this fine balance ensures that the immune cells are not too lazy and effectively recognize and deal with the invaders. An interesting question now emerges about the role of the immune system ...did it evolve to fight off invaders (as we have always considered) OR to help us live harmoniously alongside beneficial microbes? How does the immune system distinguish the good from role as distinguishing ‘self’ versus ‘not self’ must now be updated to the expanded view of distinction between the community of the human superorganism: human cells and our mutualist friends versus foes (pathogens). Microbes are no longer simply invaders to be annihilated by our immune system but residents in a symbiotic community. This discernment is the current great mystery and challenge of immunology. Immune system development and healthy function requires continual interaction with the mutualist microbes, the beneficial bacteria and parasites. A central component of balance in the immune system is achieved by the function of a recently discovered peacekeeper faction of the immune system: Regulatory T cells and Regulatory B cells that rein in the immune response. 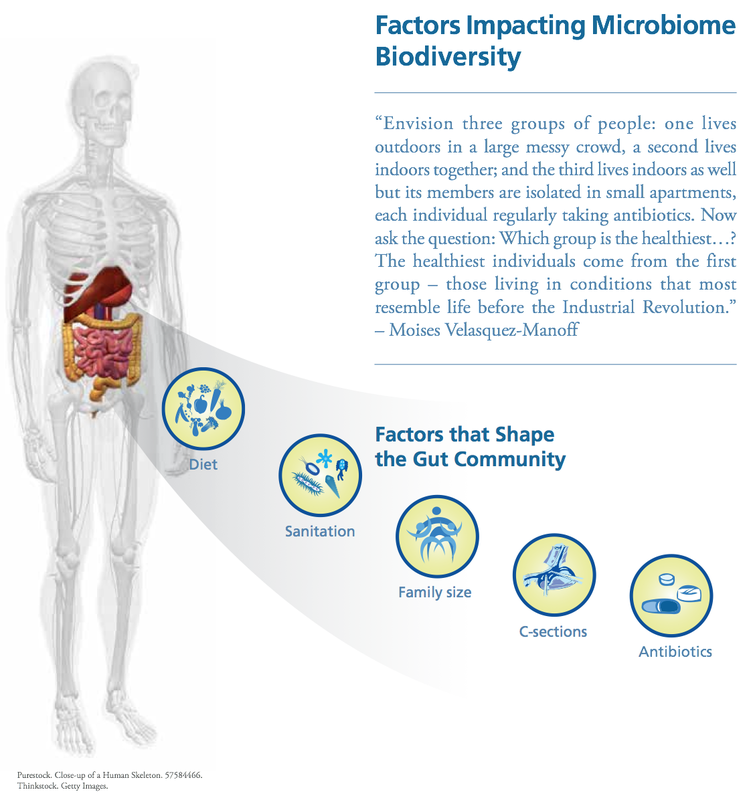 If the microbiome biodiversity declines, then immune system education is compromised, microbe encounters decline and the peacekeeper levels fall. This situation is responsible for precipitating inflammation, allergies, asthma, and autoimmune imbalances. Therefore allergies are NOT so much due to the presence of an allergen that triggers a response in the immune system but the absence of microbes that precipitates a global imbalance in our immune responses. The BodyEcolgoy course will be offered one last time LIVE and via LIVESTREAM. Click here for more info. Today’s blog is about one my favorite topics: the healing nature of conflict. You are probably familiar with Tim Hall who has written another article for us today. As you know, The BodyTalk System is about WholeHealthcare more than it is a system that cares only about health. Health without wisdom is baseless and empty. Through conflict comes wisdom. I am very excited for the upcoming BodyEcology course. Scientific discoveries such as the Microbiome reveal aspects of physiology that has always been at work, but until now it has been without our understanding of how to take advantage of this information. In a similar way, conflict has always been part of human life, but without having the understanding of its healing nature. PaRama BodyTalk in particular is designed to provide a systematic method for establishing wisdom thru the healing nature of conflict. To this end, Tim will be hosting the 4th PaRama Study Group Intensive Retreat in Scottsdale AZ this coming Memorial Day weekend. Tim was one of the 1st ten PaRama designated CBPs and has dedicated himself to this study. I encourage any PaRama member to attend his weekend group and will try to attend it myself next year. You may have seen this Sept 4th, 2013 TED talk by psychologist Dr. Kelly McGonigal who basically says that it is not stress that kills you, it is the belief that stress can kill you that kills you. Check out the video on YouTube. It may kill you to believe this, but consider that it is not disease and problems that makes you unhealthy, but the belief that they can make you unhealthy that is what is making you unhealthy. Disease, problems, symptoms or relationship struggles are all various forms of conflict. Does conflict conflict with health? Or is there healthy conflict? I’m sure there is a study about this somewhere but if not, maybe you can still agree with me on the premise: Take 10 couples all of whom have regular arguments of some kind to some degree about something. Ask them independently if arguing is a sign of a weak, failing and hateful partnership or if it is a sign of a strong, open and respectful partnership. Say that 5 couples said ‘weak’, and 5 couples said ‘strong’. If we were to check in with these argumentative couples ten years later, which set would you guess is more likely to still be together? Now, if you are thinking that the five so-called strong couples were probably miserable for those ten years, this may reveal some of your own bias about that same question. If ‘arguments’ isn’t the topic, it could as well be drinking habits, religious opinions, exercise and diet differences, sexual interests, scheduling difficulties, child rearing, snoring, romantic gestures and the list goes on and on. Somewhere there will be conflict. If conflict and health are found to be friends, then could we lump in misery too? Is misery an element of health? It would seem not, right? Then is misery an element of conflict? While that may at least seem more likely, let’s dig a little deeper. Consider the couples; if arguing is one of their conflicts and they engage with that behavior fully, they are both at least on the same page and arguing together (please note that I am not promoting or condemning arguing). If arguing is their conflict and one or both of the couples resist the behavior in themselves and/or their partner, it is easy to see how that resistance to what is actually occurring could manifest as blame, abuse, manipulation, defensiveness, turmoil, or in one word: misery. Having no resistance to arguments does not imply a resignation nor does it mean you have to enjoy it. We all have our likes and dislikes. Being content can include being content with acknowledging that some things are just not for us and that we’d prefer to improve the situation. Resisting a disease-conflict can be miserable too. Not resisting it in no way means you have to keep living with it, or embrace it or even like it. We can probably all agree that misery is an impediment to well-being of any kind. If so, then we could also agree that in the absence of misery (and therefor the absence of resistance to the conflict), that that situation would be to our benefit? Have you noticed that the times you are miserable are the times when you can’t seem to get ahead, or make any progress or have a harmonious relationship? When the conflict itself is being fought against so hard, it is nearly impossible to see a resolution. Do we believe that conflicts make us miserable? Or do we believe that conflict is a process of achieving a higher consciousness and an improved state of well-being? Perhaps now we can see the value of misery. Misery is our signpost that says, ‘You’re going in the wrong direction!’ The more miserable we become, the less we are able to continue in that wrong direction. Life is so complex that reasons and intellect cannot have the full picture. And not everyone is intuitive enough to always have deep insight into what is best for the situation but we all know what misery is. Thanks to misery, we can learn by our experience. As this happens, the whisper of intuition becomes more familiar, “You sure you want to go that way? You’ve been down that road before. I know it is scary to take this new unknown path, but at least listen and know that the way you are facing now is the path of misery.” You know that whisper. I sure do. Ask this yourself question, Am I sick and tired of being sick and tired? PaRama friends, meet me in Scottsdale AZ Memorial Day weekend and we’ll all have lots of conflict, er, wait, I mean, we’ll all Find Health together! Maybe We Should Say Thanks? The human body is a super organism, a complex ecosystem of human cells living in a symbiotic relationship with 100 trillion microbes, collectively called the human microbiome. This microbiome is packed full of friendly microbes called mutualists. Which, actually provide us with some pretty important things. Without bacteria present, the immune system remains half asleep. Digestion: They provide enzymes that allow us to get 10-30% more energy (calories) from our diet, improve our absorption of vital dietary nutrients, tune the acidity of our stomachs to the optimum and can also determine our tendency towards obesity. Vitamin production: Microbes provide essential vitamins that we don’t have the capacity to make ourselves. Brain function: Research has indicated that the nature of the gut microbiome influences communication in the brain and mood. Kidney function: Microbes can impact our tendency to form kidney stones. Healthy skin function: Microbes on the skin work with the immune system to maintain healthy skin and keep out pathogenic microbe strains. The BodyEcology Course course offered by the IBA provides more fascinating information on this hot topic. John Veltheim is a chiropractor, traditional acupuncturist, philosopher, and teacher. John ran a very successful acupuncture and Chiropractic clinic in Brisbane, Australia for 15 years. He also served as the Principal of the Brisbane College of Acupuncture and Natural Therapies for five years. His extensive post graduate studies include applied Kinesiology, Bioenergetic Psychology, Osteopathy, Sports Medicine, Counseling, comparative philosophy and theology. John has been lecturing on the international circuit for a number of years teaching Mindscape, Breakthrough, Reiki, Advaita philosophy, BodyTalk and Life Sciences. John founded the BodyTalk system and co-founded the PaRama College with Esther Veltheim.